Transcatheter aortic valves implantation (TAVI) is a valid treatment for elderly patients with symptomatic severe aortic stenosis. The PorticoTM transcatheter aortic valve system is the first fully resheathable, repositionable and retrievable TAVI device. The cited case demonstrates sheathless access is feasible with the PorticoTM system. In this case the valve system has the benefit of manageability and trackability, while reducing vascular compromise. The Policlinico di Monza (Milan, Italy) is a leader in the endovascular treatment of structural heart disease, accounting for more than 2500 procedures including transcatheter aortic valve implantation (TAVI), atrial septal defects (ASD), patent foramen ovale (PFO) and renal denervation. The team has experience with various TAVI devices and has completed more than 700 TAVI procedures. Most recently, the team incorporated the innovative Portico™ transcatheter aortic valve system (St. Jude Medical). The Portico™ transcatheter aortic valve system was the first fully resheathable, repositionable and retrievable TAVI device built on the Trifecta™ valve platform. Depending on the size of the valve chosen, the delivery system has a width of 18–19 F (6.0–6.4 mm) at its distal end (8.5 cm), where the valve is placed, and a width of 13 F (4.3 mm) on the proximal shaft. The self-expanding stent can be fully resheathed, allowing for repositioning both proximally and distally at the implant site. Thus, the Portico valve can be fully recaptured and retrieved. * The flexible delivery catheter enhances "trackability" in patients with tortuous or highly calcified vessels and minimises issues at the access site. The team’s initial experience with the Portico transcatheter aortic valve system was in June 2015. A diabetic, 82-year-old woman presented with angina and dyspnoea (NYHA III–IV). The patient had concomitant chronic obstructive pulmonary disease (COPD), moderate pulmonary disease, peripheral arteriopathy and renal failure (eGFR 35 ml/min). The transthoracic echocardiography revealed a reduced EF (≈45 %), an aortic valve (AV) mean gradient of 47.35 mmHg and a pulmonary artery systolic pressure (PASP) of 50 mmHg (Figure 1). Normal coronary arteries were found upon angiographic study. The patient’s surgical risk was determined to be extreme: Logistic EuroSCORE was 54.41 % and the EuroSCORE II was 11.74 % (STS Score 10.7 %). The patient was scheduled for a TAVI procedure. A computed tomography (CT) scan revealed severely calcified arteries at the vascular access site. Both common femoral arteries were stenotic and quite tortuous. 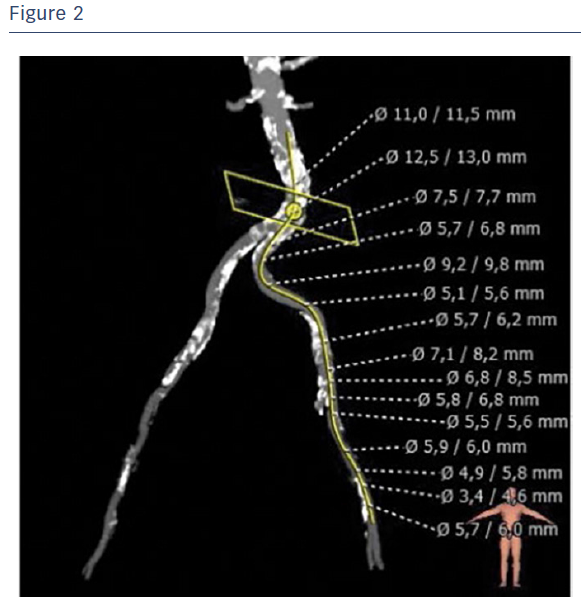 Specifically, the right common femoral artery had a mean diameter of Ø 3.5/3.0 mm and the left common femoral artery had a mean diameter of Ø 4.5/5.5 mm (Figure 2). 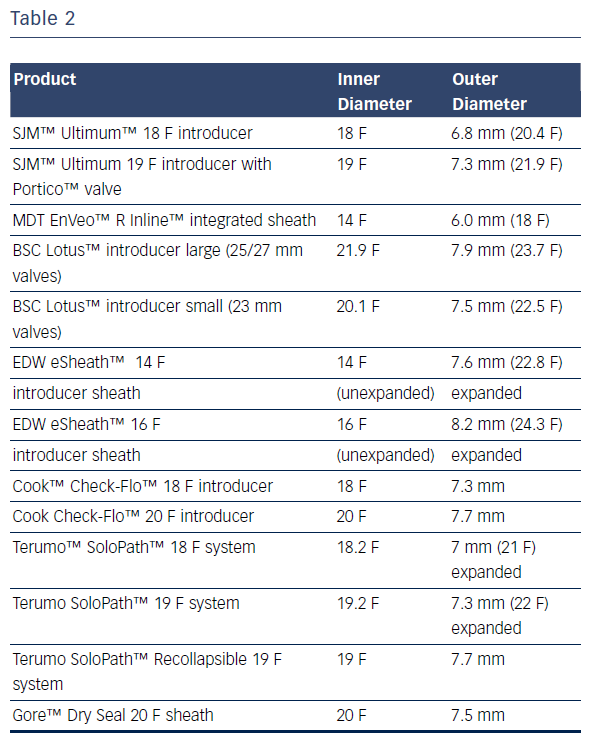 Due to their small dimensions, none of the femoral arteries were suitable for the procedure; the smallest sheath on the market has an outer diameter of 6 mm (see Table 2). Calcium infiltration into the arterial walls increased the risk for potential complications, including vascular dissection and peripheral embolisation. Based on this assessment, it was determined to use the Portico™ transcatheter aortic valve system without the introducer sheath. The TAVI procedure was performed under local anaesthesia and vascular access was obtained at the right common femoral artery via standard percutaneous access techniques. A 0.018 wire was introduced through the right common femoral artery into the left superficial femoral artery in order to protect it by using the cross-over technique. The left common femoral artery was then punctured under angiographic control. Sutures of Perclose ProGlide™ (Abbott Vascular) were placed to simplify haemostasis following the procedure. 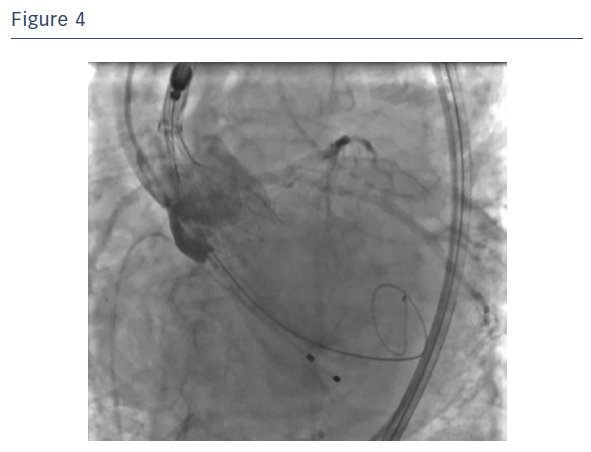 A 12 F introducer sheath and 20 mm balloon (Osypka VACS III™, Osypka AG) were used to dilate the native aortic valve and facilitate placement of the Portico valve. The 12 F sheath was then removed and the delivery system of the Portico™ valve was introduced into the artery. The delivery system was introduced without a sheath, allowing for easy access from the thoraco-abdominal aorta to the aortic arch (see Figure 3). 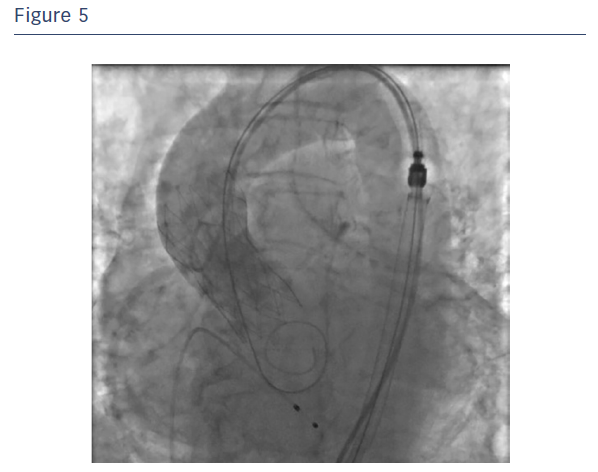 Due to the small diameter of the delivery system (4.3 mm with the exception of a 8.5 cm long segment at its distal extremity), the device exhibited good trackability and the risk of damaging the arteries was reduced during the first passage of the device and during the later maneuvers. Note that since this proximal part of the Portico™ delivery system is smaller than the distal part that houses the valve, slight manual compression was utilised during the procedure to maintain haemostasis at the access site. First, the mobility of the Portico™ valve was tested and proved to be extremely manageable. The prosthesis was then released to 90 % of its total capability (see Figure 4). If an inappropriate position had been found during the angiographic test, the valve would be partially or fully resheathed. The Portico valve was repositioned, further aligned and partially released and assessed (see Figure 5). As the test showed a very satisfying partial positioning, the Portico valve was completely released with optimal final angiographic result. It is good practice for any sheathless TAVI procedure to leave the delivery system in the descending aorta after valve deployment until final haemodynamic assessment is complete, to ensure haemostasis at the access site. 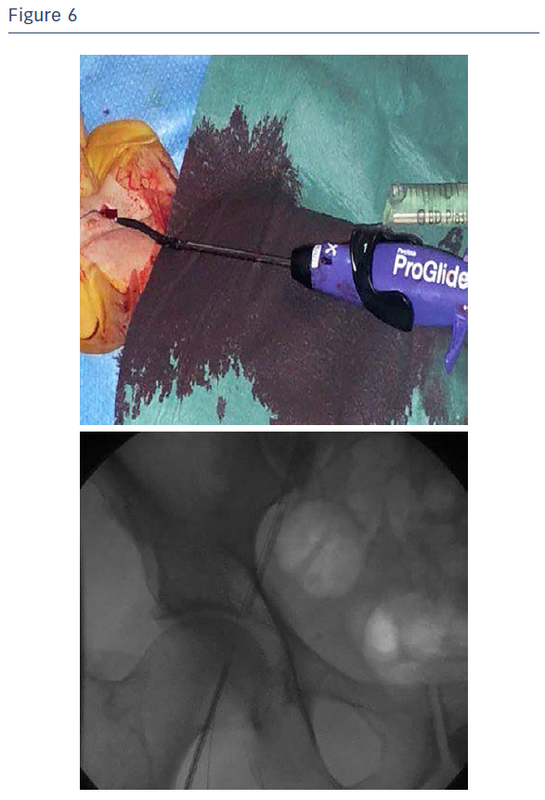 Haemostasis was easily obtained with the use of one Perclose ProGlide™ closure system combined with cyanoacrylate glue (see Figure 6). At six-month follow-up, the patient no longer had angina and her dyspnea was reduced noticeably (NYHA II). 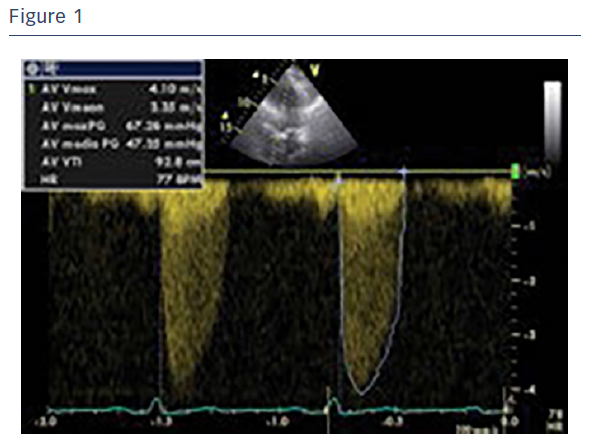 Echocardiographic imaging showed a perfectly working prosthesis without paravalvular leaks. The AV mean gradient decreased to 7.82 mmHg and the left ventricle function improved (EF 53 %). The cited case demonstrates sheathless access is feasible with the Portico™ system. In this case the Portico™ valve system has the benefit of manageability and trackability, while reducing vascular compromise. Moreover, the sheathless potential of the Portico valve improves access site management and helps achieve faster haemostasis. Portico, Trifecta and Ultimum are trademarks of St. Jude Medical, Inc. EnVeo and Inline are trademarks of Medtronic, Inc. Lotus is a trademark of Boston Scientific Corporation or its affiliates. eSheath is a trademark of Edwards Lifesciences. Check-Flo is a trademark of Cook Medical. SoloPath is a trademark of Terumo Interventional Systems. Perclose ProGlide is a trademark of Abbott Laboratories. VACs III is a trademark of Osypka AG.